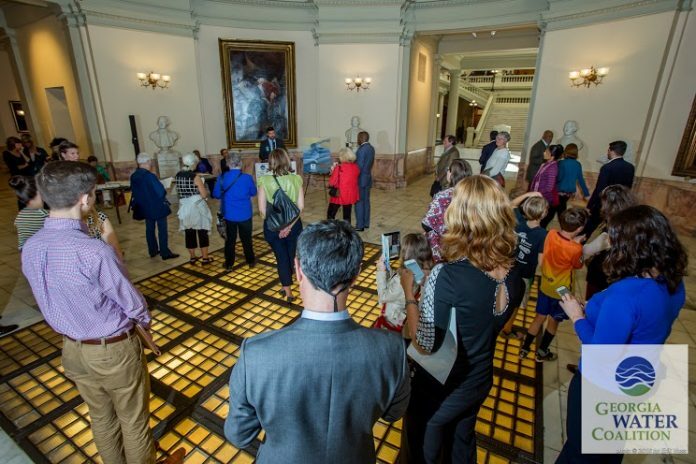 This week at Georgia’s state capitol, citizens and community leaders from around the state shared their stories and concerns about the safety of their drinking water. While our nation is transfixed on water issues in Flint, Michigan, communities right here in Georgia are also struggling with water contamination. Arsenic, bacteria, uranium, and other contaminants have infiltrated drinking water wells and other groundwater sources. Earlier this week participants of the Georgia Water Coalition’s Clean Water Day of Action traveled to Atlanta from Cairo, Waycross, Shell Bluff, and Ocilla to communicate their concerns and the need for better protections for drinking water supplies in Georgia with their legislators. But not every community has responded as quickly as the City of Cairo to address contamination concerns. Additionally, people on private wells must test their own water to determine if the water is polluted. Many of Georgia’s underground water supplies are pristine. These underground water supplies support local economies by irrigating crops, running industries, and providing drinking water for residential homes and businesses. Additionally, these underground supplies are superior to alternatives in terms of cost and reliability. Unlike in other states across the country, Georgians are fortunate to have access to and reasonable use of water on or under their property. State Sen. William Ligon (R-Brunswick), who spoke at the Clean Water Day of Action press conference, introduced Senate Bill 36 because current Georgia laws and regulations do not provide enough protections for our groundwater. There are no adequate state requirements for monitoring, testing, or reporting the volume or extent of contaminated waters that reach an aquifer by any means. Rev. Leeann Culbreath, an Episcopal deacon from Tifton, offered a profound moral reason for all Georgians to respond to the water crises faced by these various communities, when she stated at the press event, “Love of neighbor is a tenet of all major faith traditions. And sometimes, love looks like legislation. We need to support SB 36 and protect groundwater for these Georgia residents and for generations to come. We have a moral responsibility to protect our water resources and stop this suffering.” Culbreath serves as the South Georgia Outreach Coordinator for Georgia Interfaith Power & Light (GIPL), a faith-based environmental organization and partner of Georgia Water Coalition. SB 36 passed the Senate with only three dissenting votes during the 2015 session. The bill is now held-up in the House Natural Resources and Environment Committee. The bill does three things: it affirms the public nature of aquifer resources; it confirms the private property right to undiminished natural water quality from the resource; and it requires the Department of Natural Resources Board to promulgate rules that will protect private property and groundwater resources.